Oxbow Alfalfa Hay is a high-fibre legume forage hay that is sometimes called the "Queen of Forages" with higher protein, calcium and energy content than grass hay. An outstanding feed for young animals, Alfalfa Hay contains more crude protein, digestible energy, and calcium levels than any other forage. In addition, it has the fibre content needed for normal digestive functioning. It also provides the essential calcium necessary for growing bones, and is a source of important minerals, including phosphorus, potassium, magnesium, sulphur, iron, zinc and selenium. Oxbow's Alfalfa Hay should not be fed to all animals, but if used carefully, in certain situations, it can be a valuable tool in nutritional management. 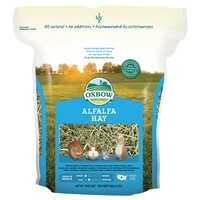 Due to it's succulent taste, Oxbow's Alfalfa Hay can also be used as an appetite stimulant when an animal is ill or for post surgical patients. Mature Pets: Offer a pinch of alfalfa as a treat. Mix different grass hays together to enrich your pet's diet. Try all tastes and textures to discover your pet's favourite. My 2 bunnies love alfalfa hay . I only give them small amounts to help them eat more hay in there diet. When my buns where younger I used to only feed them alfalfa hay and they have loved it since been babies . It must taste good because they love to munch on it .